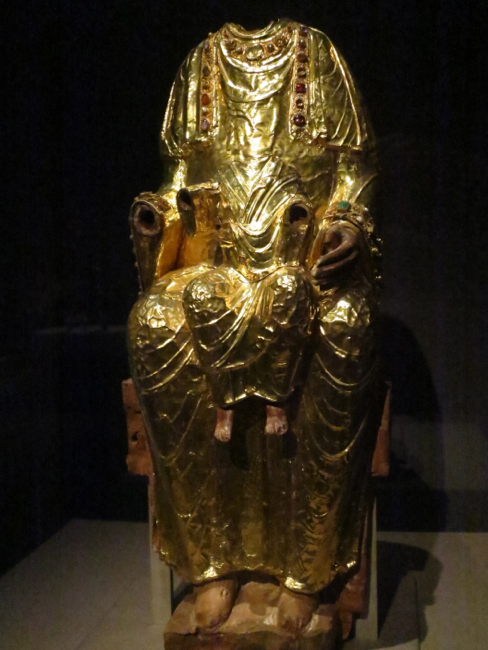 The Golden Madonna- this sadly mutilated image of Our Lady, commissioned by St. Bernward before 1022, is one of the earliest statues in the West. The Holy Roman Empire – a vague and mysterious concept to us nowadays. Yet an extraordinary exhibition of religious art at the Metropolitan Museum of Art brings the founding era of the empire close to us once again. The cathedral town of Hildesheim is now rather obscure. In the North of Germany, it is today an extreme outlying post of Catholicism in that country. Yet in the glory days of the foundation and initial flourishing of the Holy Roman Empire (say 955- 1100), it was of central importance. 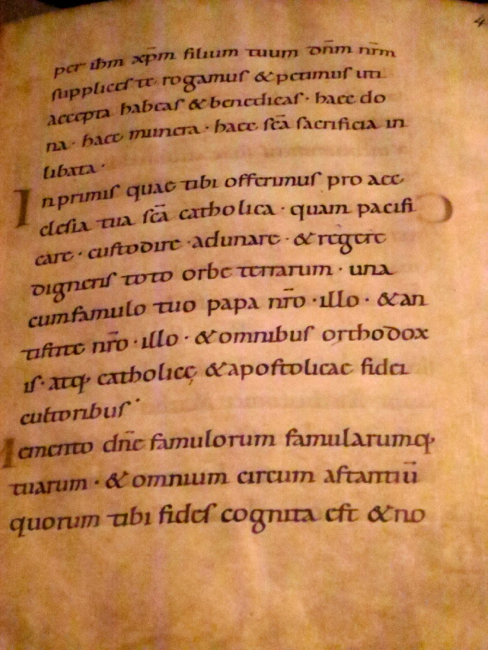 The bishopric of Hildesheim illustrated the close union of spiritual and temporal authority characteristic of the empire from its very beginnings. 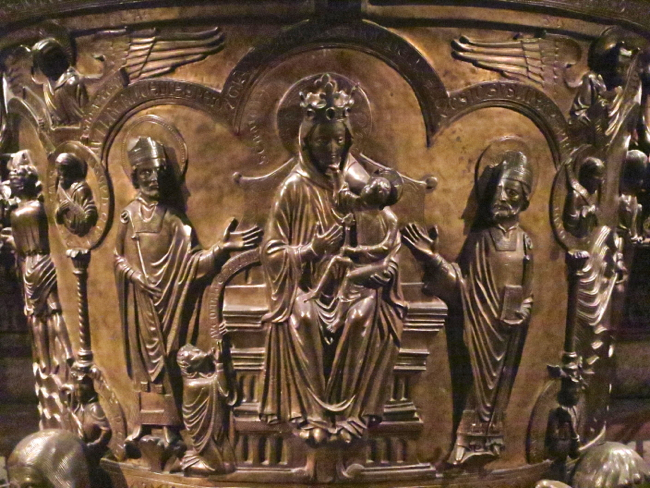 Under the patronage of several extraordinary bishops – Bernward and Godehard, both canonized, it became in the first half of the 11th century a center of first flowering of Christian art in Medieval Europe. And more of this early art survives in Hildesheim than almost anywhere else in Europe – it is rivaled only by Aachen, Bamberg and the “Welf Treasure”(mostly now in Berlin). The artistic renaissance of the early 11th century saw the building of several noteworthy churches in Hildesheim. 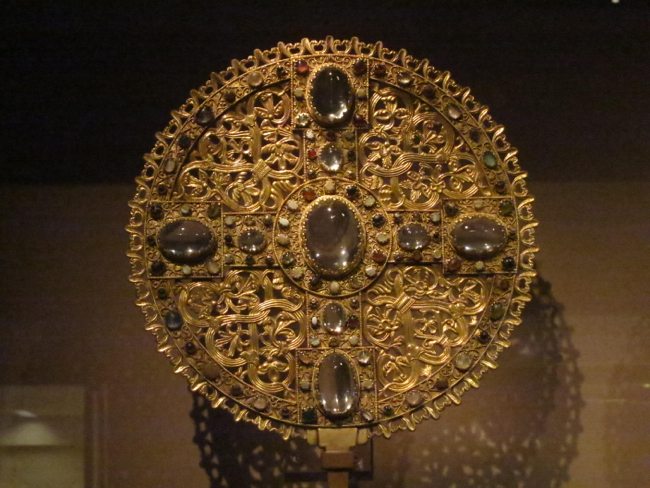 But it is especially the creations in sculpture, metalwork and in illuminated manuscripts that amaze us today. 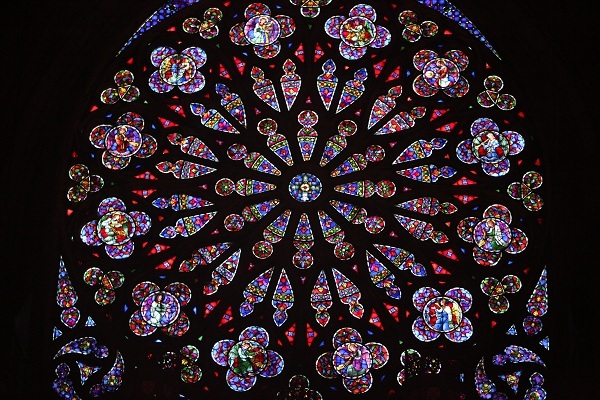 Let us remember that even Suger in the 12th century – the builder of the first Gothic church of Saint Denis – spent as much or more time describing the sacred vessels and precious ornaments of his church as he did the architecture itself. 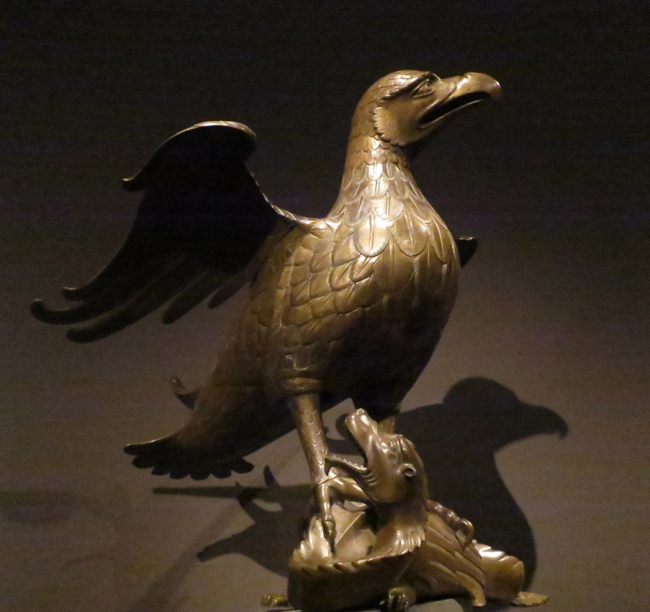 This exhibition offers a unique collection of the smaller works of art: candlesticks, croziers, chalices patens, and some items that have since fallen out of liturgical use, like three 12th century metal ceremonial fans. 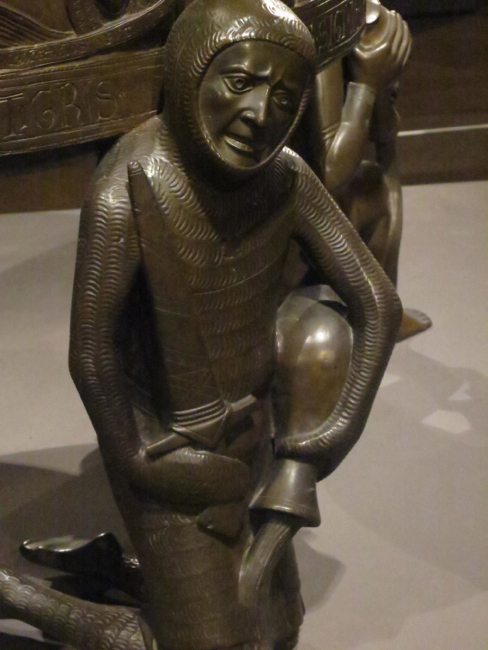 The styles range from the expressive creativity of Bernward’s candlesticks to the “classic” Gothic style of an early 13th century baptismal font. Even after Bernward’s and Godehard’s time, Hildesheim continued to flourish as an artistic center under the leadership of the Church. And Germany itself led Europe in the working of metals throughout the Middle Ages. The result was an almost unending series of masterpieces. Magnificent examples of work in gold, silver, copper and bronze from the 12th, 13th and 14th centuries are on display in this exhibition. 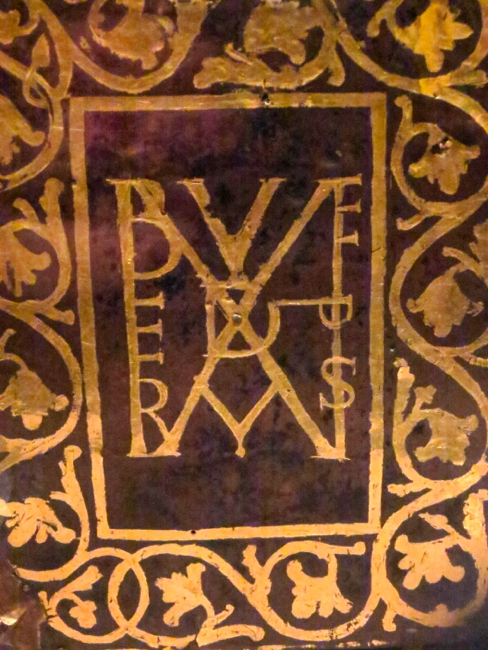 St. Bernward’s “logo” on a book cover. One of unique set of three liturgical fans – still used in the Byzantine rite. 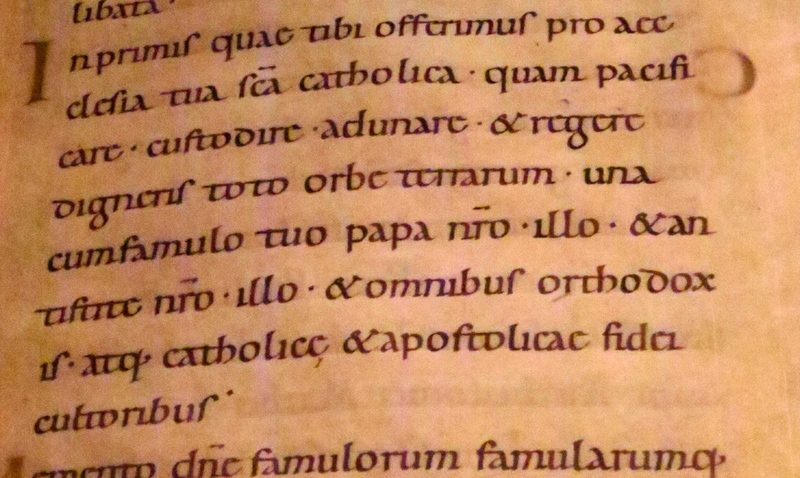 This text should be familiar to all of you – sacramentary from 1014-1022. 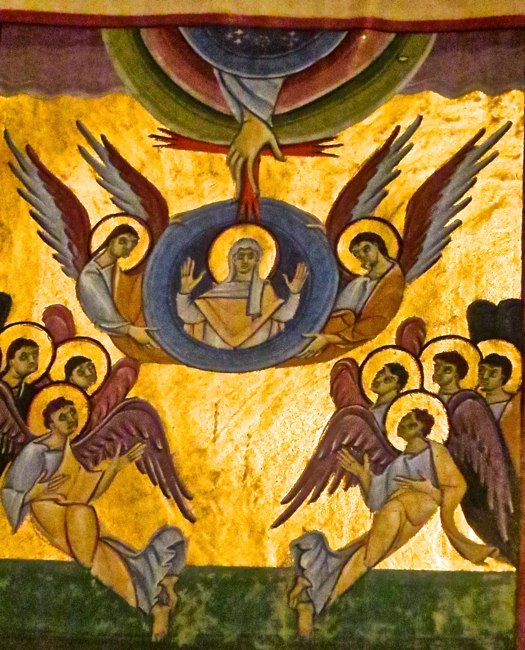 The Assumption – actually from a different artistic center of Germany at that time – the abbey of Reichenau on Lake Constance. 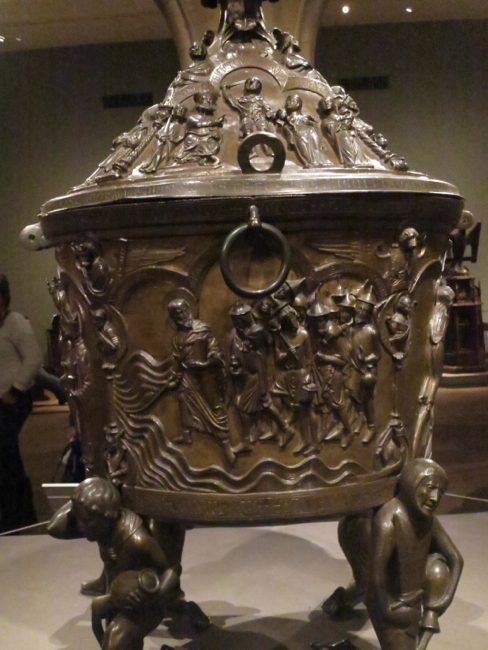 (Above and below) The spectacular early 13th century baptismal font. Sadly, after the Reformation Hildesheim became religiously divided – a “frontier” outpost where the Catholic and Protestant worlds coexisted uneasily. After the 16th century its former economic prosperity also departed. Finally, the “Rotenburg ob der Tauber of the North” was senselessly destroyed by bombing in 1945. 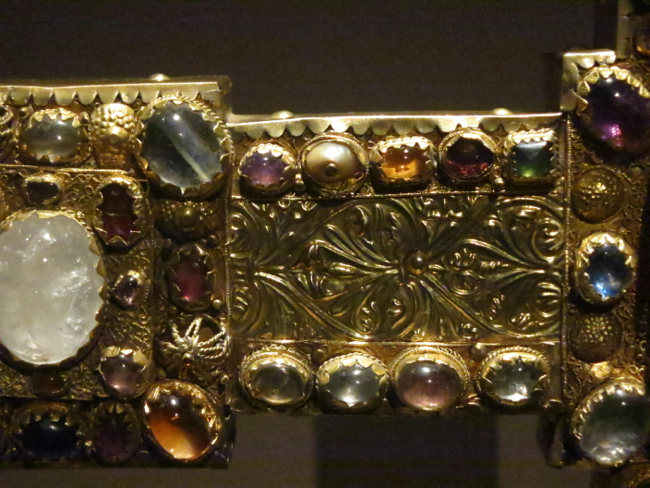 Yet the extraordinary treasures of the Middles Ages, gleaming in gold and silver, survive to this day. They witness to the birth of Western art and culture after the dark ages – and to the creation of the first mature Christian commonwealth in the West as well. Be sure and pay a visit to this exhibition before January 5th!